Each small pea-like flower of white sweet clover produces one or two seeds, and it blooms May through October. White sweet clover (Melilotus albus) and yellow sweet clover (M. officinale) are biennial herbs that are easy to identify while in flower. Flowers are crowded densely on the top 4 inches of an elongated stem, with younger flowers emerging nearest the tip. Each tiny flower is attached to the stem by a minute stalk. The small pea-like flowers are white or yellow, and each produces one or two seeds during the plant’s second growing season. Blooms May through October. Leaves are alternate, compound, with 3 leaflets per leaf. Leaflets are finely toothed and longer than broad. Second-year plants may appear bushy. These aromatic (sweet or musky) plants are members of the bean or pea (legume) family, but they are separated as “sweet clovers” and are not true clovers. Height: to 3 feet (first year), 4-5 feet (second year). Commonly found on roadsides, abandoned fields, railroad ballasts, pastures, and any unflooded, open natural community such as a prairie. These two sweet clovers grow in a variety of conditions, including hot and cold climates, and direct sunlight to partial shade. They cannot tolerate dense shade; even the thick growth of a second-year plant makes enough shade to cause its own lower leaves to fall. They seem to prefer calcareous or loamy soils with a pH of 6.5 or greater. 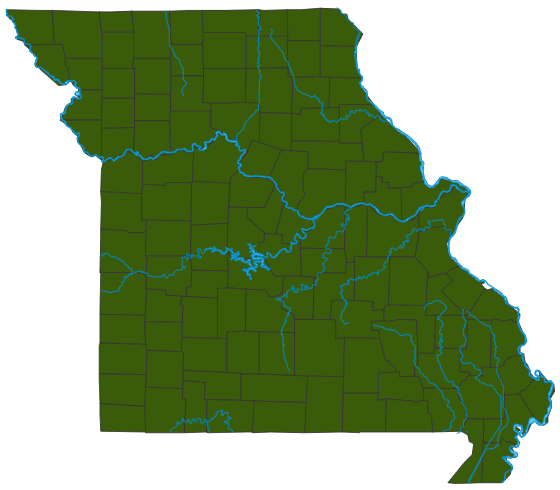 Both species of sweet clover are found throughout Missouri, most commonly in disturbed habitats. Invasive. These sweet clovers are native to Europe and Asia and can now be found in all 50 states. The earliest records of their presence in North America date to 1664. More recently, sweet clover was cultivated as a forage crop, soil builder, and nectar source for honeybees. Cultivation of sweet clovers is now discouraged due to their tendency to invade and degrade native habitats. These species spend their first growing season developing a healthy root system, then, in the second year, they flower and set seed and then die. In the first year, they are entirely vegetative: a small, branched stem with cloverlike leaves, while roots grow. The next year, new shoots emerge from the strong taproot, and they bloom from May to September, producing hardy seeds that can stay viable for more than 30 years. Sweet clovers are used as a wildlife cover crop and for production of honey. Because they are economically important they will continue to be planted. They harm natural ecosystems, so they will remain a problem for land managers well into the future. Sweet clovers readily invade open habitats and already have successfully invaded many Midwestern native prairies and open, unflooded communities.